Is Ceiling Insulation Service Your Answer? You know very well that your ceiling is in a good shape yet you have spotted a huge water mark and you wonder if any rain water made its way inside. In winter, you have your heating devices on however you feel the room temperature isn’t warm for long and the environment isn’t comfortable? One of the reasons to fix this is getting ceiling insulation services in Melbourne for your home. What happens is without ceiling insulation the hot air, being light in nature, travels up to the roof and escapes, eventually leaving your room with cold air and you find yourself shivering. Of course, this is why your electricity bills go crazy high in winters. When the heat starts to escape from the gaps, not only it impacts the temperature but cracks also start to appear overtime on the roof. You may have already come across many articles stating why it is so beneficial to get ceiling insulation done. However, you should be knowing whether you should be insulating or not. Understand how your house is constructed. If there is no space, as in an attic between the roof and the top floor, then ceiling insulation is your answer. If you have a space which can be used as a lounge or an attic, then it is better to go for roof insulation. If you only insulate the top floor, the attic will be cut off from the heat source and eventually what bills you were saving on your heating systems throughout the home, you will end up consuming it all for your attic or loft space. Whereas, the roof insulation will benefit as a barrier for both attic and underneath floors. 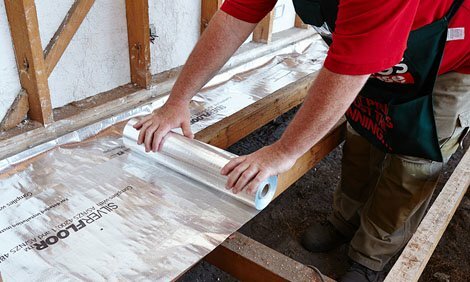 Which Insulation Option Should You Go For? Given the availability and accessibility of the ceiling, you can either get blanket insulation or loose fill insulation done. Either of the insulation options goes long way and are very effective. If there is walking space, then blanket insulation should be done, it will be covering the ceiling joists. Whereas, if the ceiling is difficult to access then loose fill insulation is what you should go for. Energy Efficiency: Once your home has been insulated, you will feel immediate difference in the room temperatures and stability for longer period of time. In winter times, the heat will of course travel up towards the roof, but it will not escape and in summer, the heat will remain locked underneath the roof not letting it travel down and hence, keeping the rooms in stable temperature in either season. It is always suggested to get your pipeline work done before you get insulation installed, especially if there is any leakage. Once the ceiling insulation is done, the moisture problem is then taken care of from then onwards. Posted in Construction & Building on September 27, 2018 by Tatiana Brewer. Essential Tips To Know About Outsourcing Your Accounting Processes!